Our experiences and insights from working with Pikku Huopalahti eventually got us even more excited about doing something substantial to stir up discussions about Helsinki’s future. The city has been in the process of drafting a new strategic city plan to guide the city’s growth until 2050. Once enforced, this plan will necessarily have a tremendous impact on what Helsinki will be like 35 years from now – for better or for worse. To help make sure it won’t be the latter, we decided to draft our own strategic plan. We named the project Pro Helsinki 2.0 as a tribute to Eliel Saarinen, who published a plan called Pro Helsingfors in 1918 to guide how Helsinki could grow into a world city. Find the entire plan on our website (in Finnish only). As my blogging and our earlier project might already entail, our attempt is to illustrate how Helsinki could become denser and more urban. In our vision for 2050, Helsinki has grown by half a million within its jurisdiction. And more precisely, mostly within Ring Road I. The Pro Helsinki 2.0 city plan. 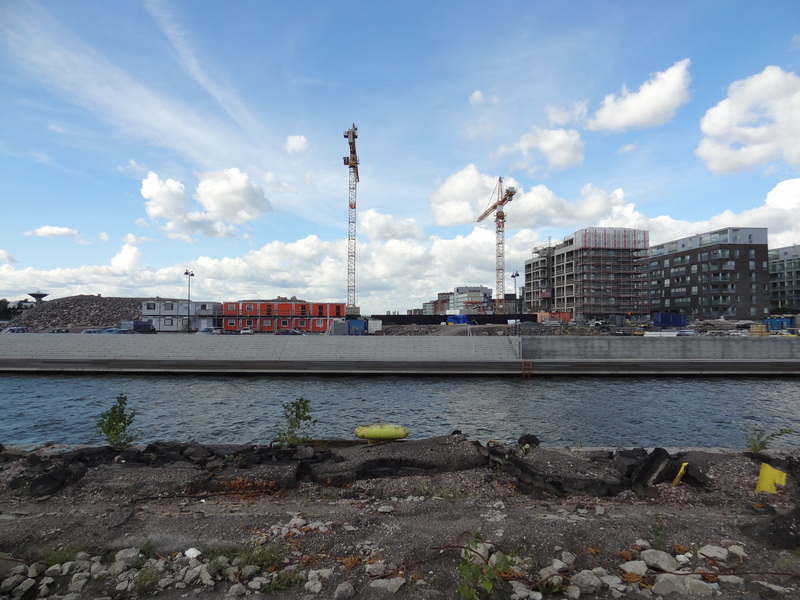 The new development we propose is marked with orange. Map by Urban Helsinki. View the full zoomable map here. In his time, Eliel Saarinen envisioned a model for Helsinki’s outward expansion based on dense urban nodes and railway connections. Hardly any of his ideas ever materialized. Now a century later, we’ve envisioned a plan to turn Helsinki into a world city by drafting a model for growing inwards. Future growth will be accommodated by making the inner city larger as well as creating new and strong urban nodes not too far from the old urban core. This will create critical masses to introduce and upkeep a good choice of services also outside of the city center, give more people the possibility to walk to their everyday destinations, and allow the city to develop a comprehensive public transport network. Concentrating more people closer together also leads to more jobs. And finally, dense neighborhoods mitigate the need to build up parks and nature areas. Land-use patterns in comparison. Two very different ways of making homes for 300 people. Image by Antti Auvinen. Much of the new development will be built 1) along highways by retrofitting them into urban boulevards; 2) in previously strictly-for-business areas by retrofitting them into mixed-use neighborhoods; 3) on railway yards and other land-consuming functions that are hogging up valuable land in the middle of the city; 4) and between existing neighborhoods to connect them with each other. A precondition for our plan to be successful is that Helsinki needs to learn how to make urban blocks, streets and public spaces again. Density is only attractive if coupled with the qualities associated with urban neighborhoods. Focus needs to be put on diverse streetscapes, buildings facing the street, shops and other businesses, and putting pedestrians first. Essentially, planning should be done from the perspective of pedestrians. 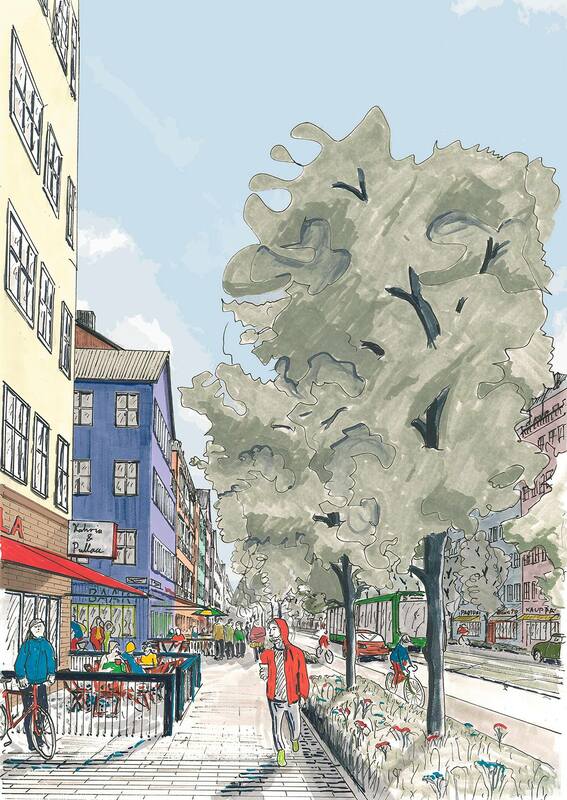 A future street in Helsinki, we hope. Image by Niilo Tenkanen. Another precondition is that to build those urban neighborhoods, we need to evaluate our existing zoning and building codes critically. 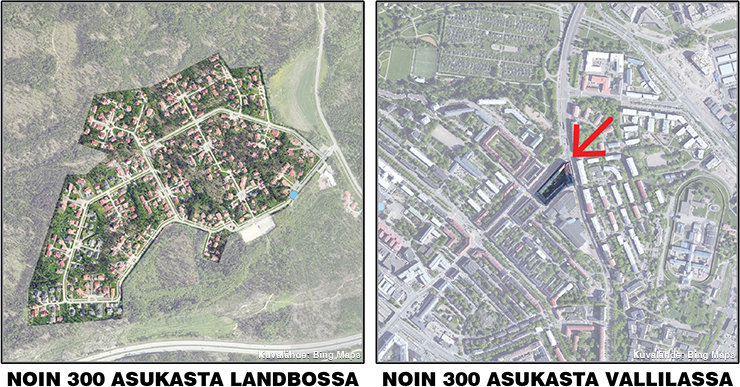 At the moment it would be illegal to build anything comparable to Helsinki’s most highly valued neighborhoods. It sounds ludicrous, but the inconvenient truth is that there are many regulations in place that effectively block all chances of applying time-tested concepts of good city-building. These have been summoned by authorities from various departments who all mean well, but concentrate on observing the world solely through their line of work. In the city-making business, the whole is greater than the sum of its parts. We need to put places first. So why are we doing what we’re doing? Well, besides that we really love Helsinki and want to see it prosper, we want to give citizens the opportunity to compare and contrast alternatives once the City Planning Department’s official plan draft is out. Urban planning is a complex topic to discuss and also plans at all scales are often very complex documents to grasp. This makes it extremely difficult for even professionals to give insightful feedback just based on a single vision. Also, Helsinki hasn’t built any new truly urban areas since the 1930s or 40s. 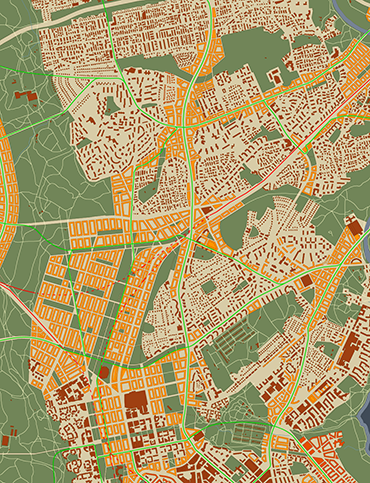 On the very contrary, Helsinki has evolved into one of the most sprawled out urban areas in Europe. In just over half a century, while the population of the urban area considered to be Helsinki has grown five-fold to well over a million, the city’s geographical scope has multiplied by nearly a hundred times. Finnish sprawl in Helsinki’s suburbs. In our plan this spot will get retrofitted into urban blocks. Helsinki’s expansion with a sprawl pattern has caused some very serious negative impacts that keep on getting worse if nothing is done. For instance, for many people and for most trips, driving is by far the most convenient way of getting around. Structuring life around walking is a privilege for those few who live in the inner city. And while Helsinki’s public transportation system is of very good quality in terms of trustworthiness and infrastructure, too often travel times between destinations are considerably longer than if you just got behind the wheel. I’m not going to walk you through all of sprawl’s negative effects as most people are well aware of them. But I want to emphasize one equally important reason I and my colleagues have spent hours after hours to draft this plan in our free time: the need to offer people more choices. And especially for urbanites like us. You don’t need to be a rocket scientist to note that there is an imbalance in how much good quality dense urban fabric Helsinki can offer to those seeking urban lifestyles. The story is that throughout the city’s significant growth period during the latter half of the 20th century and early 21st century, Helsinki’s inner city has pretty much stayed the same. Planners in Helsinki and neighboring municipalities focused on building suburban neighborhoods after suburban neighborhoods believing that this is what all people want. Of course that never was the case, but mainstream urban policy had just one goal in mind. Eventually, we’ve collectively managed to develop an urban area that offers inner-city housing options for only about 17% of the Capital Region’s residents. And even fever if looking at the entire City Region. This is what many want, but for some reason it has been impossible to provide it. Now’s time to change things. Image by Niilo Tenkanen. The best way to grasp the imbalance is to compare apartment prices. Choose any apartment in the inner city and you’ll need to pay considerably higher prices than in the rest of the city. Not to mention the rest of the country. With the price of a small studio in central Helsinki you could get a mansion in the countryside. This brings us to the other side of the same problem: increasingly many won’t opt for the mansion even if they got it for free. Just like “Millennials” are changing the housing market in America’s sprawling metropolises, also Finnish young adults are often dreaming of settling into urban communities. Unfortunately, there just isn’t enough supply to meet the demand. Many need to resort to a plan b and move someplace that “could be worse”. A story I keep on hearing all the time – most recently last week when catching up with an old friend who just relocated back to Helsinki from New York with her family. The big question is what will happen if Helsinki proceeds with its new city plan and urban policies as if it still was 1960? I believe that ultimately, Helsinki can forget about competing with Stockholm, Copenhagen or any other European metropolis if it can’t offer good quality of life or affordable housing for people thinking about working there. Today’s economy is based on services and innovations, both of which need people interacting with each other. And more fundamentally, aren’t cities supposed to focus on delivering happiness for their residents? On the bright side, the new city plan comes at a time when Helsinki still has hope. The city can still soothe damage caused by sprawl and focus on the needs of 21st-century urban dwellers. But it will need to turn around its current, sprawl-inducing, planning culture to do so. Helsinki’s potential to develop into a diverse urban center is thanks to the fact that Finland has a low urbanization rate (around 70%), mostly due to our late industrialization process. The rate is however increasing constantly as new jobs are being formed in cities and because cities attract increasingly many urban lifestyle-seekers. Construction cranes is what we’ll be seeing in our cities for a long time coming. If we were to follow what has for example happened in neighboring Sweden (their urbanization rate is 85%), Finland’s future urbanization process translates into a pool of hundreds of thousands of people still moving into cities in the near future from rural areas. And also many others already statistically considered to be living in cities are on the lookout for better neighborhoods if they were available. Because there are still a lot of people who are extremely likely to move in the coming years, I can’t stress the importance enough of focusing on the patterns of urban development Helsinki and other growing urban centers are viewing for their future growth. Considering the already present imbalance in matching the city’s housing supply with living preferences now is Helsinki’s last chance to react and focus on zoning neighborhoods that offer urban settings for urban lifestyles. Suburbia is no longer a priority; there is more than enough of that to go around. This is exactly why we decided to act and highlight the importance of looking at cities as diverse entities that offer options for everyone. 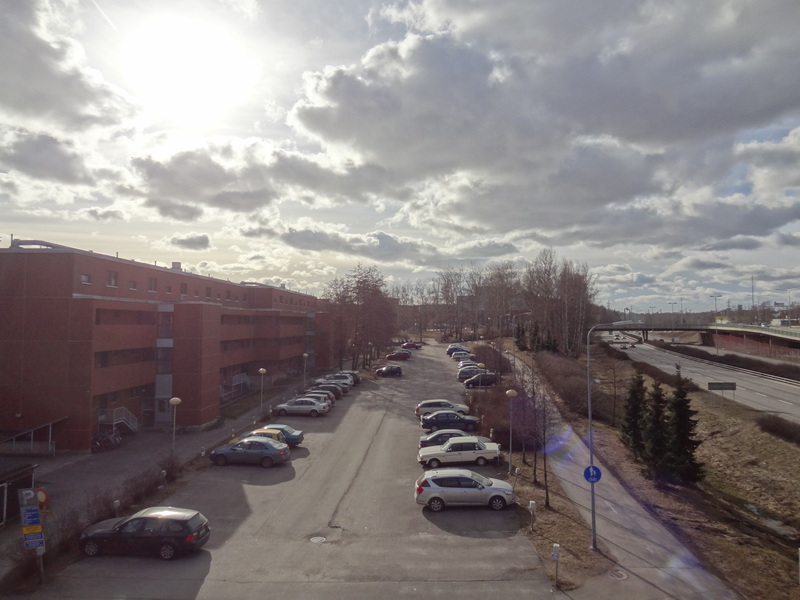 This is how Helsinki’s inner city could expand north to Pasila. Map by Urban Helsinki. I hope that our work not only creates intense discussions about Helsinki’s urban planning policies, but also brings about serious thoughts on the need to shift towards co-creation. It would be more fruitful to have citizens and authorities draft visions together instead of planning activists like us needing to crash the party with alternative plans to get their voice heard. But in all honesty, we don’t have a clue what will happen next. Nothing similar to Pro Helsinki 2.0 has really ever been done before in Finland. Stay tuned to find out. And in the meanwhile, you can help our chances of making a serious impact by spreading the word. Previous PostCity of Boulevards or City of Malls? Urban Transport Infrastructure Retrofits Are Changing the Urban Landscape in Helsinki and TampereNext PostChanging Work Patterns and the Rise of Urban Innovation Districts – The Future in Finland? Brilliant! I’m glad there are like-minded people pushing the urbanist agenda here. I love Helsinki and I would love to see it become more diverse and vibrant city while embracing urban density. Good work!